Photo by RetyiRetyi/Pixabay.com • Carolina wrens are small, inquisitive and hardy songbirds. The recent Elizabethton Christmas Bird Count found a record number of this wren during its annual survey of bird populations. I participated in the 76th consecutive Elizabethton Christmas Bird Count, which was held Saturday, Dec. 15. This annual count is one of the oldest Christmas Bird Counts in the region, as well as in Tennessee. I was one of twenty-eight observers in six parties. Together, we tallied 77 species, which is above the recent 30-year average of 72 species. The all-time high was set last year when 85 species were counted on this annual survey. Photo by Bryan Stevens • An osprey perches in a tree along the Watauga River in Elizabethton, Tennessee. These fish-eating raptors are rare in winter in Northeast Tennessee. Two species — osprey and orange-crowned warbler — were found on this CBC for the first time. Longtime count compiler Rick Knight observed that one noticeable difference between last year’s count and the 2018 Elizabethton CBC was the number of ducks. Last year’s CBC yielded 13 species, but only six species of ducks were found this year. Knight also noted that a record number — 139 — of Carolina wrens was spotted by CBC participants. A single bald eagle was found, but it was enough to continue a recent trend. This eagle has appeared for 19 of the last 20 on the Elizabethton CBC. Counts more than 20 years ago rarely produced any bald eagles. A single red-shouldered hawk represented a good find since this hawk has only been found on six of the previous 25 years. A single merlin represented an even more exceptional find for this CBC. Merlin has been represented only two times in the last 25 years for this particular count. Photo by Bryan Stevens • This captive red-shouldered hawk was rehabilitated after suffering an injury and now works in an educational program at Brookgreen Gardens in South Carolina to teach the public about raptors, other birds, and various types of wildlife. Knight noted that two shorebirds — killdeer and Wilson’s snipe — have experienced a steady decline in making this annual count. This year’s count produced only a single killdeer and snipe. Knight speculated that low numbers of cedar waxwings and American robins on this year’s CBC probably indicates a poor wild fruit crop. These two species depend heavily on fruit to supplement their diet during the winter months. Chipping sparrow has now been found for 15 straight years, but had only previously been reported six times in the first 50 years of the history of the Elizabethton CBC. Without fail, some species manage to evade counters. According to Knight, some of the conspicuous misses this year included ruffed grouse, common loon and barred owl. Photo by Bryan Stevens • Although found during counts held in other seasons, no ruffed grouse was found on the 2018 Elizabethton Christmas Bird Count. The Elizabethton Bird Club has been holding its annual Christmas count in Elizabethton, Tennessee, since 1942. The tradition of the Christmas Bird Count dates back much farther and originates from a less than bird-friendly custom. According to the National Audubon Society’s website, so-called sportsmen in the late 19th century would conduct a “Side Hunt,” a rather blood-thirsty Christmas custom that saw hunters competing to see who could score the largest amount of feathered and furred corpses. The Christmas Bird Count is now conducted each year on dates between Dec. 14 and Jan. 5. The first CBC took place in December of 1900 with 27 observers participating at 25 locations in the United States and Canada. Fifteen of the counts were conducted in the northeastern United States from Massachusetts to Philadelphia. Results from that first count in 1900 didn’t truly reflect the diversity of North America’s birds, but they were nonetheless interesting. The Greater Boston CBC boasted only one participant and only found 17 species. However, some of those species included such good birds as American tree sparrow, brown creeper, Northern shrike and Northern bobwhite. For me, the Christmas Bird Count is a fun holiday outing with friends. There’s also satisfaction in knowing the results gathered from these nationwide counts will also contribute to the body of citizen science that helps experts determine the status of our feathered friends. For a complete tally of this year’s Elizabethton Christmas Bird Count, please see the online sidebar to this week’s column at HeraldCourier.com. Canada goose, 459; wood duck, 1; American wigeon, 1; American black duck, 1; mallard, 150; bufflehead, 182; and hooded merganser, 11. Wild turkey, 57; pied-billed grebe, 16; horned grebe, 11; double-crested cormorant, 1; and great blue heron, 29. Black vulture, 5; turkey vulture, 19; osprey, 1; sharp-shinned hawk, 1; Cooper’s hawk, 4; bald eagle, 1; red-shouldered hawk, 1; and red-tailed hawk, 17. Photo by Bryan Stevens • Wilson’s snipe are not often found in the winter in Northeast Tennessee. American coot, 1; killdeer, 1; Wilson’s snipe, 1; and ring-billed gull, 14. Rock pigeon, 296; Eurasian collared-dove, 4; mourning dove, 126; Eastern screech-owl, 4; and great horned owl, 2. Belted kingfisher, 21; red-bellied woodpecker, 26; yellow-bellied sapsucker, 11; downy woodpecker, 30; hairy woodpecker, 4; Northern flicker, 25; and pileated woodpecker, 20. American kestrel, 16; merlin, 1; Eastern phoebe, 11; blue jay, 128; American crow, 291; and common raven, 10. Carolina chickadee, 80; tufted titmouse, 72; red-breasted nuthatch, 1; white-breasted nuthatch, 29; and brown creeper, 10. Winter wren, 4; Carolina wren, 139; golden-crowned kinglet, 38; and ruby-crowned kinglet, 15. Eastern bluebird, 122; hermit thrush, 7; American robin, 17; brown thrasher, 1; and Northern mockingbird, 50. Photo by Bryan Stevens • The Northern Mockingbird has been the official state bird for Tennessee since 1933. European starling, 592; cedar waxwing, 30; orange-crowned warbler, 1; palm warbler, 1; and yellow-rumped warbler, 32. Eastern towhee, 22; chipping sparrow, 29; field sparrow, 34; Savannah sparrow, 4; fox sparrow, 3; song sparrow, 129; swamp sparrow, 8; white-throated sparrow, 70; white-crowned sparrow, 20; and dark-eyed junco, 66. Northern cardinal, 159; red-winged blackbird, 25; Eastern meadowlark, 4; house finch, 34; American goldfinch, 46; and house sparrow, 8. Photo by Bryan Stevens • A total of 159 Northern cardinals made this species a common bird on the recent Elizabethton CBC. This entry was posted in Bristol, Bristol Herald Courier, Bryan Stevens, Bryan Stevens Feathered Friends, Christmas, Christmas Bird Count, Christmas birds, Christmas traditions, Elizabethton Christmas Bird Count, Elizabethton Star, Erwin Record, Frank M. Chapman, History of Christmas Bird Count, Johnson City Press, Jonesborough Herald and Tribube, Kingsport Times, McDowell News, Osprey, Ospreys, Project FeederWatch, Uncategorized and tagged Autumn, Blogs, Bristol Herald Courier, Bryan Stevens, Christmas Bird Count, Christmas birds, Christmas customs, Christmas traditions, elizabethton bird club, Elizabethton Christmas Bird Count, Elizabethton Star, Erwin Record, Johnson City Press, Jonesborough Herald and Tribune, McDowell News, nature, North Carolina, Peeps, Rails, Ruffed Grouse, Tennessee, Virginia, winter, Winter birds on January 6, 2019 by Bryan Stevens. Although some people like to get an early start on holiday shopping, I’m certain some, like myself, are still in the process of checking those lists. If you’re looking for some ideas for bird and nature enthusiasts on your list, I’ll make a few modest suggestions that could result in making the season merry and bright. Photo by Bryan Stevens • Field guides are an essential tool for bird identification. If you’ve enjoyed watching the birds that congregate at your feeders or noticing the visitors to your yard and gardens, but you’ve also become curious about the identities of all your feathered visitors, it might be time for a helpful and informative field guide. I prefer field guides illustrated with paintings rather than photographs, but I have a varied collection of guides. I started a long time ago with the Golden Guide to Birds. It’s a classic and still a great guide to help interest children in the birds around them. Some of the guides I recommend and use myself these days are National Geographic Field Guide to the Birds of North America, The Sibley Field Guide to Birds of Eastern North America, and Peterson Field Guide to Birds of Eastern and Central North America. Any of these field guides should be easily found online or in stores at a cost of under $20. If you have already acquired a good basic field guide, perhaps you’re ready for more specialized field guides that focus on particular families of birds or on the behavior of backyard birds. For the warblers, there are several field guides available, including the Stokes Field Guide to Warblers, A Field Guide to Warblers of North America (Peterson Field Guides), and the Warbler Guide. For a handy guide to identify some of the birds seen on beach and coastal vacations, consider such titles as Stokes Beginner’s Guide to Shorebirds and Shorebirds: An Identification Guide to the Waders of the World, and National Audubon Society Pocket Guide to Familiar Birds of Sea and Shore. For fans of hawks and allied raptors, several guides exist including A Field Guide to Hawks of North America (Peterson Field Guides), Birds of Prey: Hawks, Eagles, Falcons, and Vultures of North America, and Hawks from Every Angle: How to Identify Raptors In Flight. In short, there’s a field guide for every family and grouping of birds. With expertly rendered illustrations or photographs, brief and concise text, and helpful range maps, nothing beats a good field guide forYea, improving one’s ability to identify birds. I recommend thumbing through the pages of a good guide over trying to randomly use Google to search online for a bird glimpsed for a brief time. Photo by Pixabay.com • A well-stocked feeder is a first step toward attracting more birds to your yard. Bird feeders come in an astounding variety of shapes and sizes. Nothing will do more to bring birds into our daily lives than maintaining a well-stocked feeder. Be certain to include a bag of sunflower seeds so that your gift will allow the recipient to immediately begin to enjoy the parade of birds sure to flock to the feeder. Photo by Bryan Stevens • Birds, like this Eastern bluebird, appreciate nest boxes. It’s never too early to start thinking about spring and the return of many of our favorite birds. To bring more birds into our lives, it doesn’t hurt to encourage them by providing man-made nesting and roosting boxes. Many of our favorite birds — Eastern bluebird, tree swallow, tufted titmouse, white-breasted nuthatch — are cavity-nesting species but will just as readily raise their young in nesting boxes as in a hole in a tree. With boxes customized to their own particular needs, other birds such as Eastern screech-owl, wood duck and great crested flycatcher will also make use of bird boxes. Many gardening centers, produce stands, feed stores and other shopping outlets sell bird boxes of various designs, shapes and sizes. If you’re shopping for a bluebird box, be certain that the recipient’s yard is a spacious one. Bluebirds feel more comfortable in open surroundings. If the yard is more overgrown and woodsy, consider a box tailored more for a woodland bird like a chickadee or a nuthatch. Photo by Pixabay.com • A good pair of binoculars will bring birds much closer. Unless requested, don’t buy binoculars for an adult. Most birders would prefer to pick out their own pair to use to make up-close and personal bird observations. An inexpensive pair, however, could be perfect for fostering in a child an interest in birds and nature. If you have grandchildren, children, or even nephews and nieces, a beginner’s pair of binoculars could make a life-altering gift that lets the recipient view the world in a whole new light. Birds have always been a popular photography subject for calendars. There’s an almost endless variety of bird calendars, but I’m partial to one produced by the Lee and Lois Herndon Chapter of Tennessee Ornithological Society, of which I am a member. This annual fundraising endeavor features some exceptional bird photography from club members. This year’s calendar features full-color photographs of some of the region’s most colorful and engaging birds. The club sells the calendars for $15 each. For an additional $2 shipping fee, calendars can be sent to any address in the United States. All proceeds are used to support birding opportunities and bird-related causes. The calendar also features an informative calendar grid with highlights for major holidays as well as important bird-related dates. The calendar’s pages feature more than 80 full-color photographs of area birds, including common favorites and some not-so-common visitors. The front cover features a dazzling photograph of a male rose-breasted grosbeak. If you’re interested in obtaining a calendar, email ahoodedwarbler@aol.com or look up Elizabethton Bird Club on Facebook. Photo by Bryan Stevens • A bird-related Christmas ornament makes a nice gift. The branches of my Christmas tree are always weighted heavily with a variety of bird-related Christmas ornaments. Holiday tinsel and baubles make the season look a lot like Christmas if they feature some of our favorite birds such as cardinals, chickadees, hummingbirds, penguins, doves, geese, eagles or any of the other popular species of birds. Choose a fun and unique bird ornament for the enthusiast on your Christmas list. This entry was posted in Bird, Bird calendars, Bird Christmas gift ideas, Birding, Birds, Bristol, Bristol Herald Courier, Bryan Stevens, Bryan Stevens Feathered Friends, Christmas birds, Common Birds of Northeast Tennessee, Elizabethton Star, Erwin Record, Field guides to birds, History of Christmas Bird Count, Johnson City Press, Jonesborough Herald and Tribube, Kingsport Times, McDowell News, nature, Uncategorized, Winter birds and tagged Bird, Bird calendars, Bird feeding, Birding, birds, Birdwatching, Blogs, Bristol Herald Courier, Bryan Stevens, Christmas, Christmas birds, Christmas customs, elizabethton bird club, Elizabethton Star, Erwin Record, facebook, greeneville sun, Johnson City Press, Jonesborough Herald and Tribune, Kingsport Times-News, McDowell News, nature, Tennessee, The Erwin Record, Virginia, Winter birds on December 16, 2018 by Bryan Stevens. The shopping days before Christmas are getting fewer, so I hope everyone has had time to find gifts for everyone on their lists. My own sincere wish to readers is that everyone gets to enjoy a great holiday that just might also include watching some birds. A male Northern Cardinal takes a bath at the home of Tom and Helen Stetler in Elizabethton. Although I hate to see the colorful birds of spring and summer — scarlet tanagers, Baltimore orioles, indigo buntings, rose-breasted grosbeaks — depart every fall, the winter season offers some compensation. Often, when we think of the birds of the winter season, our thoughts focus on some of the less-than-colorful feeder visitors — the brown sparrows and wrens, the black and white chickadees, the drab American goldfinches so unlike their summer appearance. There’s one bird, however, that makes an impression in any season. The Northern cardinal, especially the brilliant red male, stands out against a winter backdrop of snow white, deep green or drab gray. 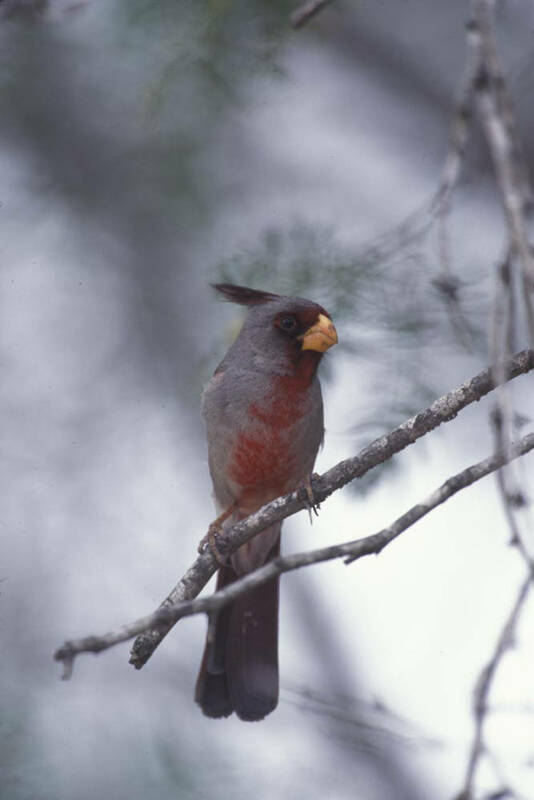 The Pyrrhuloxia is a relative of the Northern Cardinal found in the southwestern United States. The Northern cardinal belongs to a genus of birds known as Cardinalis in the family Cardinalidae. There are only two other species in this genus, and they range across North America and into northern South America. The two relatives are the pyrrhuloxia, or Cardinalis sinuatus, of the southwestern United States, and the Vermilion Cardinal, or phoeniceus, a bird found in Colombia and Venezuela. Two other South American birds — red-crested cardinal and yellow-billed cardinal — are more closely related to tanagers than to our familiar Northern cardinal. Both the Northern cardinal and red-crested cardinal have been introduced into the state of Hawaii, so two non-native birds from different parts of the globe are now resident in the Aloha State. 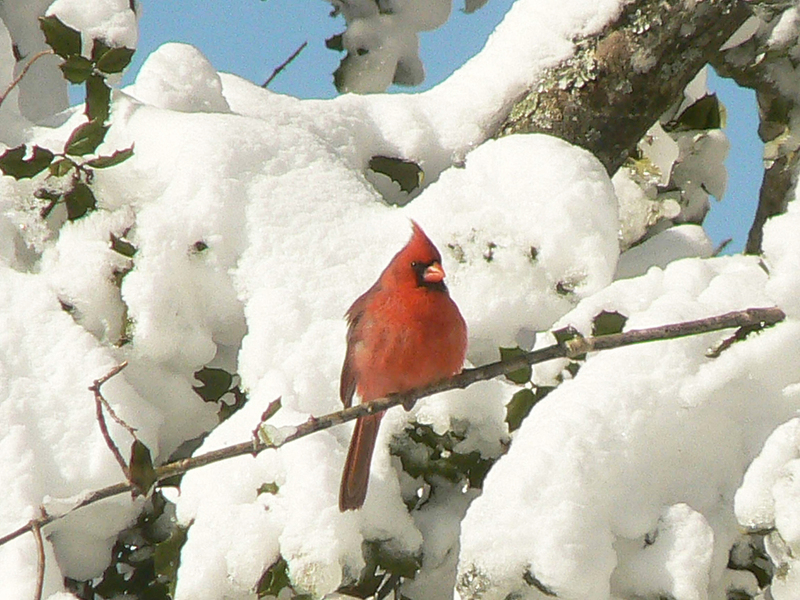 Over the years, the Northern cardinal has also become associated with the Christmas season. How many Christmas cards have you received this holiday season with a cardinal featured in the artwork? I’d wager that at least a few cards in any assortment of holiday greetings will feature the likeness of a bright red cardinal. 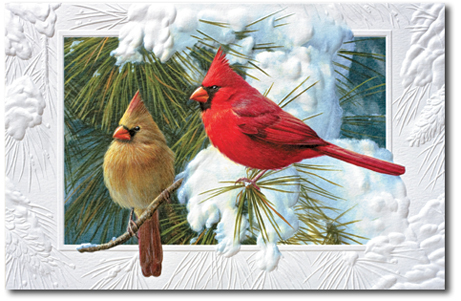 This sample Christmas card from cardinalchristmascards.com is a good example of the way Christmas cards often depict this beautiful bird. 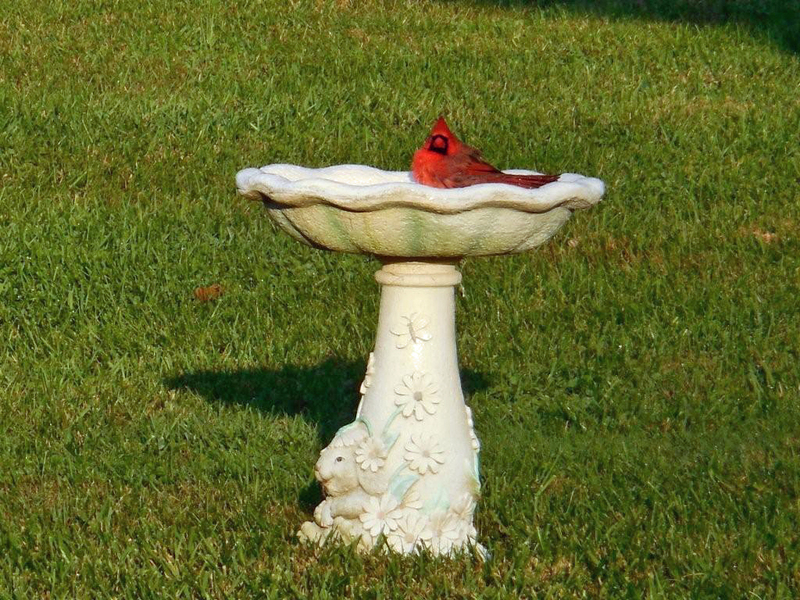 Cardinals, also known by such common names as redbird and Virginia nightingale, are easily recognized backyard birds. I never tire of observing these colorful birds. Cardinals are easily lured to any backyard with plentiful cover to provide a sense of security and a generous buffet of sunflower seed. 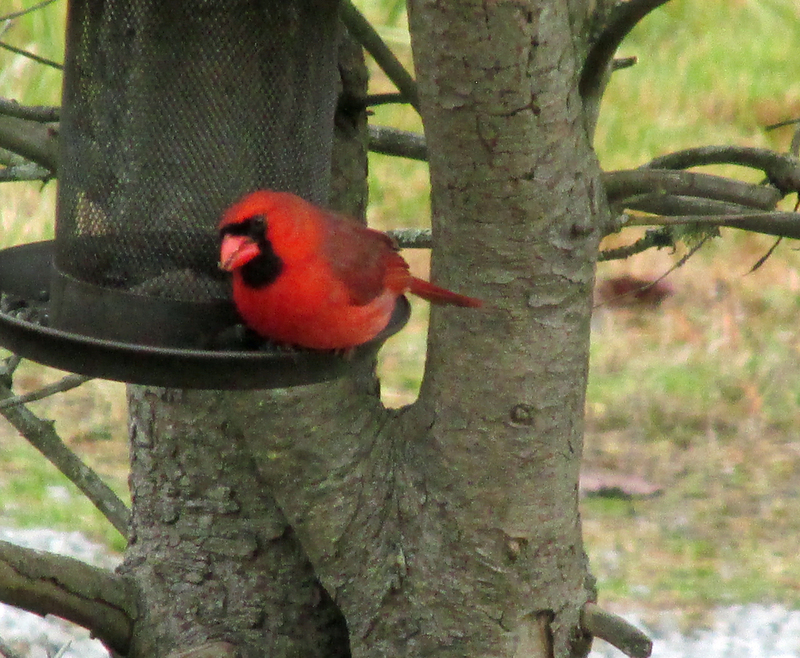 Cardinals accept a wide variety of food at feeders. Sunflower seed is probably their favorite, but they will also sample cracked corn, peanuts, millet, bakery scraps and even suet. The cardinal is also one of only a few birds that I have noticed will consistently feed on safflower seed. While we may get the idea that cardinals feed largely on seed, that is a misconception based on our observation of the birds at our feeders. When away from our feeders, cardinals feed on insects and fruit, including the berries of mulberry, holly, pokeberry, elderberry, Russian olive, dogwood and sumac. 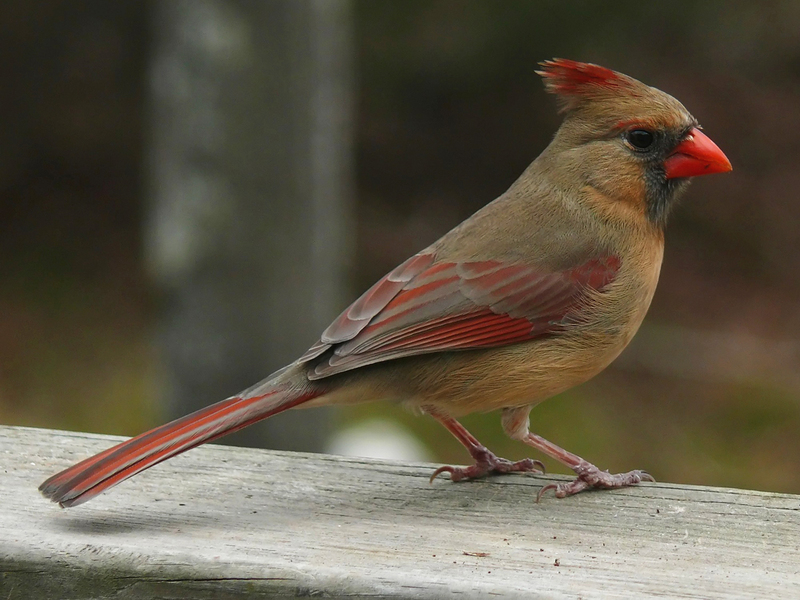 Even the female Northern Cardinal offers observers admirable, subtle beauty. There’s no difficulty in identifying a cardinal. The male boasts crimson plumage, a crest, a black face and orange bill. The female, although less colorful, is also crested. Female cardinals are soft brown in color, with varying degrees of a reddish tinge in their feathers, particularly in their wings. Immature cardinals resemble females except young cardinals have dark bills. 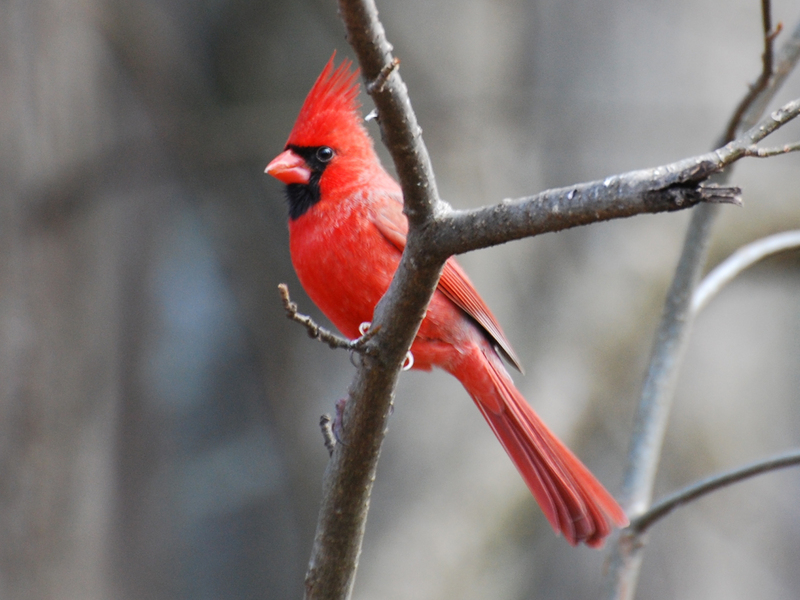 Cardinals are a widespread species, ranging westward to the Dakotas and south to the Gulf Coast and Texas. The southeastern United States was once the stronghold of the cardinal population. In the past century, however, cardinals have expanded their range into New England and Canada. A pair of Northern Cardinals perch on a feeder for a meal of various seeds. 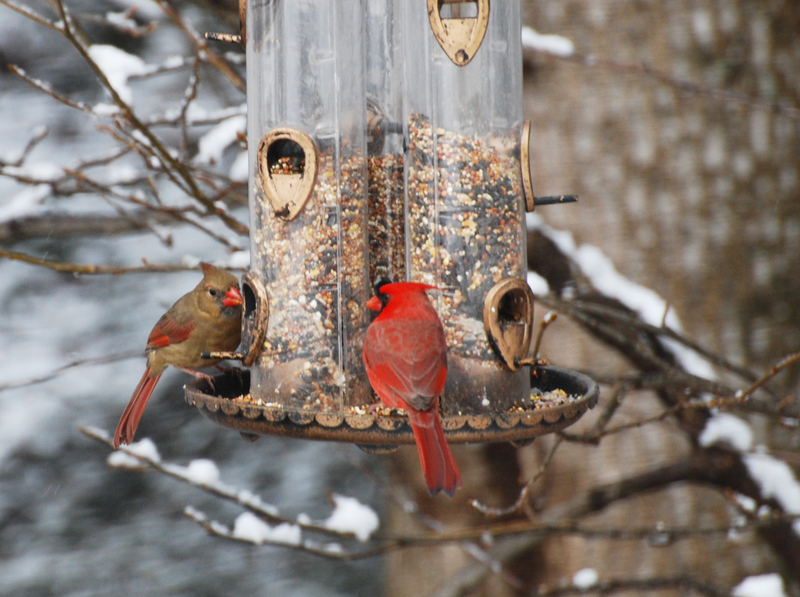 At feeders, cardinals mingle with a variety of other birds. Their preference for dense, tangled habitat is one they share with such birds as brown thrashers, Eastern towhees, Carolina wrens and song sparrows. In general, however, cardinals directly associate only with their own kind. Cardinals will form loose flocks during the winter, but these flocks are never as cohesive as those of such flocking birds as American goldfinches. Cardinals are more often observed in pairs. Cardinals are common visitors to backyard feeders. For such a bright bird, the male cardinal can be surprisingly difficult to detect as he hides in the thick brush that conceals his presence. Cardinals are nervous birds, however, and usually betray their presence with easily recognized chip notes. It’s not surprising that such a popular bird has also become associated with many trappings of the Christmas season. Photo by Jean Potter Male Cardinals always brighten gloomy winter days. I can be included among such people. My Christmas decorations include an assortment of cardinal figurines and ornaments. There are other birds — doves and penguins for example — associated with the holiday season, but for me the holidays magnify the importance of one of my favorite birds. The cardinal, in its festive red plumage, appears made to order for a symbol of the holiday season. Photo by U.S. Fish and Wildlife Service A male Northern Cardinal perches on a branch on a snowy winter’s day. There’s additional evidence to put forward as testimony to the popularity of the Northern cardinal. It’s the official state bird of seven states: Virginia, North Carolina, West Virginia, Ohio, Illinois, Indiana and Kentucky. Only the Northern mockingbird, which represents five states as official state bird, even comes close to the Northern cardinal in this respect. Even once the holidays are past, there’s nothing like a glimpse of a Northern cardinal to add some cheer to a bleak winter day. Photo by Jean Potter This male Northern Cardinal’s red plumage makes him stand out against a snowy background. 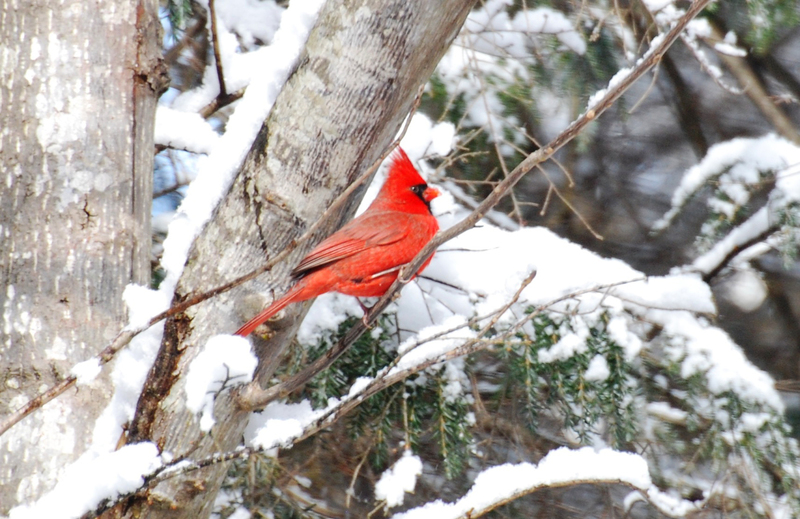 This entry was posted in Birding, Birds, Cardinal and tagged Bristol Herald Courier, Cardinalis cardinalis, Cardinals, Carter County Compass, Christmas birds, Christmas customs, Christmas traditions, Elizabethton Star, Erwin Record, McDowell News, Northern Cardinal, pyrrhuloxia on December 21, 2014 by Bryan Stevens.